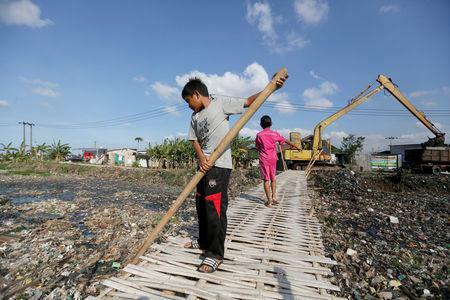 PISANG BATU RIVER, Indonesia (Reuters) - Boys played and chatted on a rickety wooden ramp under a baking sun in West Java, while just below their feet flowed one of Indonesia's most horribly polluted rivers, clogged with hundreds of tonnes of smelly trash. 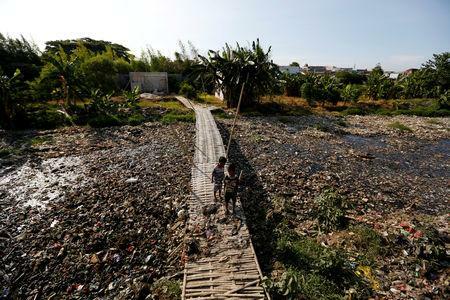 Authorities in the nation of 260 million are battling a lack of recycling culture or environmental awareness to achieve an ambitious target of a 70 percent cut in marine plastic debris by 2025, despite having devoted $1 billion a year to the task. 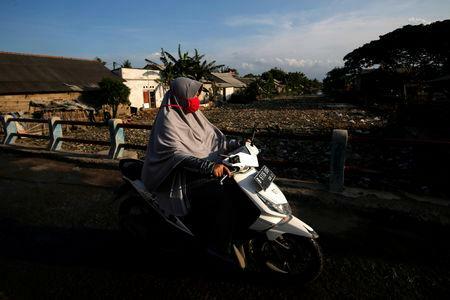 "Even though we've brought an armada of 25 garbage trucks that take three turns every day, the reality is...we haven't cleared even half of it," said Suseno, the village security chief in Tarumajaya.